The moon in eclipse glimpsed through trees and smoke. 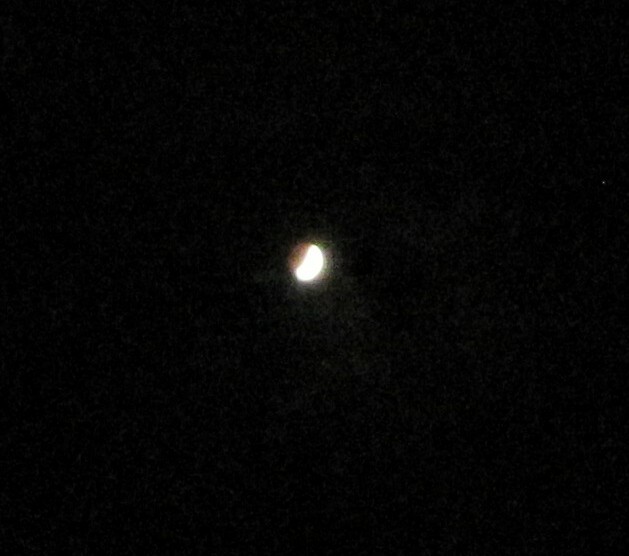 As many of you know, there was a total lunar eclipse earlier this month (October 8th, 2014). In my little crevice of the world, it coincided with a planned, controlled burn. I was up early to catch the eclipse, but had to take it in peeks since the smoke from the prescribed burn was thick in the air. The eclipse was awesome! It went from a pretty well lit night (if you make an exception for the forest fire smoke in the air) to total and utter blackness and eventually moonlight again just in time for dawn to put in an appearance. The moon turned red with the eclipse, or was it because of the smoke? I’m not clear on that, but it was a pretty awesome effect since Halloween is right around the corner. The controlled fire was set just a few miles from my home and since northern NM has a history of prescribed burns going awry, there was some tension in the valley and lots of checking hourly with the official websites. All went well with the fire, which lasted the few expected days and ended with a nice autumn rain. But while waiting that out, the smoke laid heavily here in the valley. We kept doors and windows closed to reduce the burning smoke sensation as much as possible. I have asthma, but I take my daily medication and rarely think of it. Truly, I can go a whole year or more without having to use an emergency inhaler. But this smoke made my lungs work (and burn), so I was using my inhaler proactively (before there was an issue). But that also means, I wasn’t sleeping well as the inhaler medication makes one a bit twitchy. So, yeah for total lunar eclipse, sadness for the smokey atmosphere. Smoke from the controlled burn very near my house.